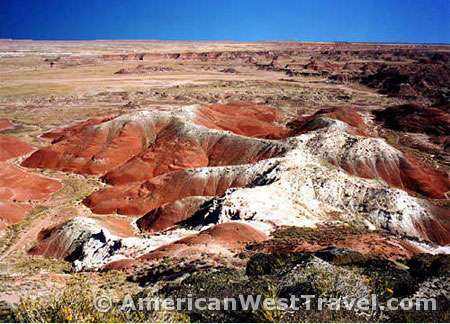 The northern reaches of Petrified Forest National Park extend into the heart of the Painted Desert of northeast Arizona, a colorful fantasyland of mesa, buttes, and badlands. This is a designated wilderness area. 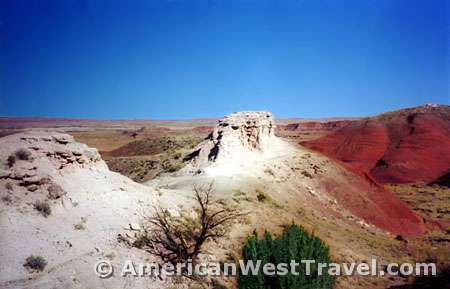 A trail leads from the park road near the historic Painted Desert Inn. If you walk even a short distance, you will leave almost all the tourists behind on the busy road, and enjoy an experience of beauty and solitude. 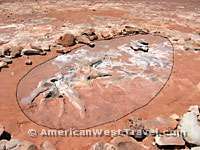 The area is covered by the “Chinle formation”, a very soft layer of earth consisting mainly of mud, sandstone, and volcanic ash. 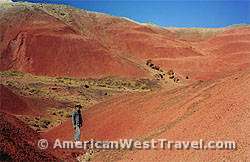 The softness allows for fantastic erosion effects as well as colorful staining by mineralized water flows and mineral deposits over the eons. 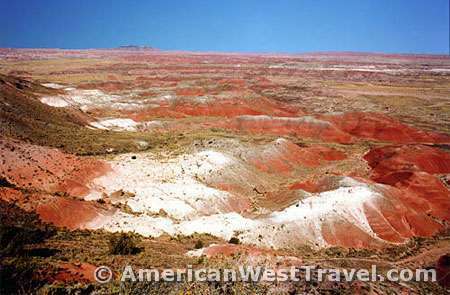 As the Painted Desert erodes, the fossilized artifacts from the Triassic era (220 million years ago) become exposed, most notably the remains of an ancient conifer forest. 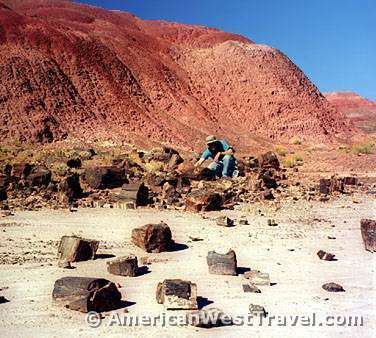 This is the world’s largest and most beautfiul concentration of petrified wood. 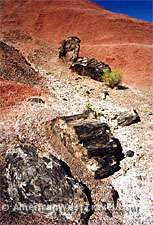 As you walk the wilderness trail you will be able to explore the petrified wood deposits in a surreal and unspoiled setting. Interestingly, most of the pertified wood in this area is stained black while the hills are stained bright red. In the southern part of the park the wood is bright red, and the land tinted in dark colors. Look carefully as you walk through these soft clay hills. 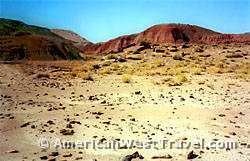 They are in a constant state of erosion, and you could discover some fascinating artifact just becoming exposed. I noticed a small glinting white object poking out of the ground. Upon closer inspection it was a small skull of modern origin, perhaps a mouse. But the possibility that it could have been a dinosaur fossil was exciting. It is easy to dream when you have unspoiled solitude. The petrified wood deposits here are also fascinating. They frequently accumulate in the drainage cracks as they roll off the hillsides (left and above right). The cross sections of these logs are often bejewelled with quartz and other colorful minerals. Many are imbedded with specks of a crystalline material which glitter in the sunlight. Most national parks have spectacular roadside stops for their tourists. But take a little time to see the beauty just beyond the road!